The Dome Shelter concept is proving extremely popular as an economical shedding solution which provides better working conditions when installed over yards and drafting races. This is due to the fabric cover giving little radiant heat in summer compared to steel, and the high rise of the roof promoting convectional currents, creating a pleasant atmosphere. The Dome Shelter, along with Westarp and A-Shade, are trusted brands of the AWP Group , which has been designing, sourcing, manufacturing and installing thousands of Dome Shelters over the last 15 years for use in sheep, cattle yards and feedlots, piggeries, machinery and hay storage, aircraft hangars, temporary workshops, bulk storage and aquaculture. In the past five years, mining and other major industries have taken on the concept for its straightforward, easy-to-use, easy-to-install structures that have the flexibility in design to mount on various sized sea container configurations commonly used for workshops and storage. Dome Shelters are supplied in kit form with comprehensive instructions and can be freighted economically to major centres throughout the country. A broad range of fabric options are available, not only are there options for block-out or opacity, but also a wide selection of colours attainable. 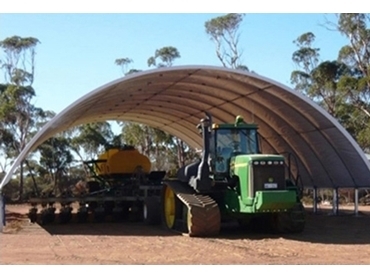 With the extensive range of standard sizes and the ability to custom design shelters to suit individual needs, Dome Shelters has got farmers’ needs covered.